Our committees can always use a new member to bring fresh new ideas and energy. Join Today! Read our newsletter here. It's published every spring and fall. 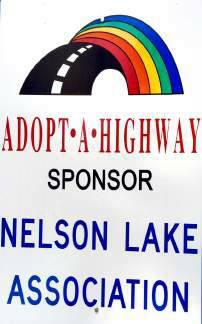 Welcome to the Nelson Lake Association web site! On January 9, 1934, a resolution was brought before the Sawyer County Board by Frank O. Nelson, a member and an untiring worker for conservation, to “build a dam across the Totagatic River to create a large flowage or lake from the backwater, suitable for fish and which would furnish a refuge and breeding grounds for all kinds of wildlife”. The dam was to be located a few miles North of Hayward. The first work done toward the construction of the dam was commenced in October, 1935 and completed in August 1937. Unfortunately Mr. Nelson died on November 15, 1935 before he could see the dam completed. After his death the County Board passed a resolution naming the flowage being formed at the big bend of the Totagatic, “Lake Nelson” in his memory. In the spring of 1940 the water had raised to the level we see today with the water running over the spillway of the dam. Barnes, and 18,500 being in Sawyer County, Town of Lenroot. There are four public boat landings, one below the dam and 13 landings at resorts and campgrounds, plus a County Park located next to the dam with picnic tables, grills and restrooms. For people it is home, a weekend retreat, a place of business, a summer home or vacation destination. It is home to at least three pair of nesting eagles, two osprey nests, four pair of nesting loons, and a nesting pair of Trumpeter Swans, many Canadian geese, assorted ducks, blue herons and numerous song birds. Turtles, fish and fishermen, red fox, logging operations, river otter, the family dog, bear, porcupines, personal watercraft, wild rice, a snowmobile trail, water celery and kayaks are on, in or around the lake. Water skiers, beautiful sunrises and sunsets, raccoons, swimmers, ice houses, ermine, canoes, duck hunters, the family cat, pontoon cruises and maybe a timber wolf are part of the Nelson Lake community and environment. It is resorts, condominiums, restaurants and bars, Friday night fish fry, campgrounds and RV parks, permanent trailers and RVs, people who live here full time, and those who visit for a day or a weekend. The purpose of the Association is to preserve and protect Nelson Lake and its surroundings, to enhance the water quality, fishery, boating safety, and aesthetic values of Nelson Lake, as a public recreational facility for today and for future generations while respecting the interests of property owners and the public and to provide the opportunity for fellowship among Association members.